← My Journey with Job ~ Who then, is my Friend? Rarely, any more, do I find myself reading straight through a book stopping only for necessary transactions with the outer world. My lifestyle has changed in such ways that the “all nighter” is no longer an option. I do, occasionally, find something that is more than just “interesting.” Remnant is one of those finds. As it happens I know the author of Remnant in the Stars. She has become a good friend and her sense of humor and her intriguing outlook on life has often brought a smile to my face and mind. That upbeat attitude is evident in her writing. She does not employ stoic, cardboard-faced characters. The story is peopled with interesting characters, each with their own unique qualities. Not only is each character fully developed and in full possession of who he/she is; the journey each one travels shows a clear character arc. Even if you don’t always know what is coming up, you can see the struggle each lead character experiences in the process of getting from where he or she is to where he or she must go. The basic story line is based on an uneasy alliance between humans and a race of beings that fled the destruction of their home star in search of a new permanent home. The refugees are not a violent race; in fact they have very strict moral codes that state that murder is murder even if it is caused by a lack of action rather than direct action. This makes for interesting plot curves. Not all humans are willing hosts and the story begins with a point-on-point battle between the factions. One of our lady leads is severely injured. In the meantime, something has gone terribly wrong with one of the scouting expeditions looking for a new home. This requires a search and rescue operation and things get a bit interesting. Booked onto a small merchant ship, a team of humans and an Aolanian, (a short, reptilian type of alien with a delightful way of using English) are off on a mission to play decoy while the main fleet does the looking. Well, we wouldn’t have main characters if they weren’t involved in the main action, now would we? Cindy develops the quirks of her aliens well. Aolanians speak in present tense – always. In their own language they use telepathy for the nuances so there is no need to describe then, now, when or such mundane sorts of speech. There is also a supporting cast of aliens that are some form of pure energy. Some of them are rather nice; some are quite nasty. And then there is a worried chieftain of a people that look more like moving rocks than anything living. Each clearly defined, each with a racial “personality,” each holding a very special place in the story. The story follows three major characters, our lady fighter pilot, the Aulanian father trying to make a good choice between signing on to find his lost daughter or staying home and teaching his youngest how to use her emerging mental powers, and the lost daughter herself. All things converge in the end, but along the way each of the characters must make hard choices that many of us face in one form or other as we find our way through life. That, in my mind, is one of the best parts. Cindy writes a beautiful story of how people make choices and what guidance, or lack thereof, they rely on to make those decisions. Cindy is a Christian and her story is clearly a statement of her reliance on a guiding hand. That statement is written beautifully. Even when her alien friend does not understand her belief, he still understands that it sustains her in moments that would otherwise destroy her. It is he that lectures a human that friends do not drive hope from friends; they support and encourage even if they don’t understand. 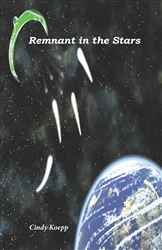 Yes, this is a delightful read full of humor, serious choices and great space-battle scenes. It;s a rollicking good read and I sincerely hope these characters find their way into some future publication.